Are you angry or scared? Surprised or excited? Happy or sad? 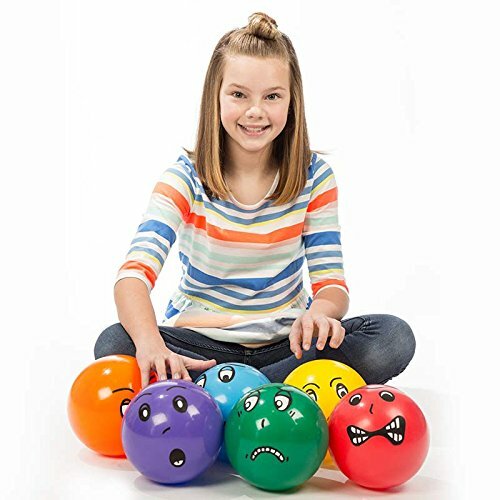 Identify the facial expressions on our colorful Emotion Balls. Find the ball that reflects how you feel, then toss your emotion away or hold onto it to play. Aids in self-expression, empathy and mood regulation. Supports social skills and self-awareness. Inflate with pump (sold separately). Includes 6 balls. Each ball (deflated) weighs 2 oz. 8Ã¢â'¬Â Diameter. Plastic. Red, orange, yellow, blue, green and purple. Coated card stock. Surface wash. Use with adult supervision. All ages.